September 28th-30th a group from the Chicago Aikikai and the Chicago Aikido Club made the five-hour drive to the southern tip of Illinois for Andy Vitale’s seminar at the Southern Illinois University Aikido Club in Carbondale. The club where last century Vitale Sensei got his start in Aikido. Friday and Saturday’s classes were held inside at the Student Recreational Center. Open hand techniques were shown with an emphasis on connection and precise movement. 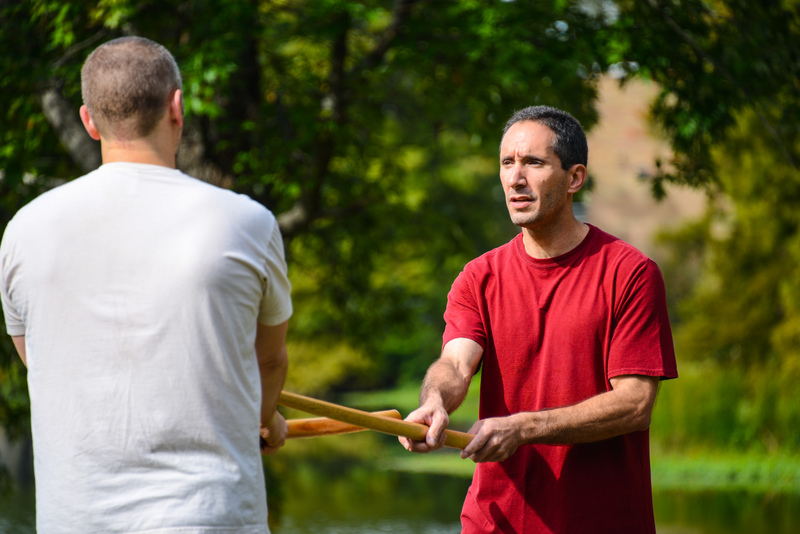 Sunday’s class was held outside by a small lake where training focused on bokken and the spacing and timing involved with the use of weapons. The SIU Aikido Club is open to everyone not just students and faculty of the University. This mix was represented at the seminar. There was a large group of first semester students and smaller group of seasoned Aikidoka in attendance. Vitale sensei used many ukes to demonstrate techniques. For some it was their first time taking ukemi in front of class. Every evening there were activities. When asked where he wanted to go to dinner Vitale Sensei said it didn’t matter what kind of food it was his only concern was that it be a place were everyone could go and would be affordable for all. Friday night we had so many people with us we got our own room at a local pizza parlor. Saturday Brian Stanfield opened his home and hosted a potluck and BBQ. Sunday we gathered at a Chinese buffet and could have stayed there all day except for the five-hour drive we had in front of us, which didn’t feel as long as it sounds. Below are some notes members of the SIU dojo wanted to share about Vitale Sensei’s seminar. Well, I only was able to attend the Friday part of the seminar, but what I learned from that one night really helped. I reviewed and remembered how to do kotegaeshi. There were also movements Mister Vitale showed me to do that helped me with other techniques I had trouble with. I actually feel like I could perform some of the techniques, like shomenuchi ikkyo, without having to go through too slowly. There was not too much that was new that I got to learn, but that day was very helpful and I am very thankful I got to meet with you guys that day. I began studying Aikido here at SIU this past January. Taking the time to immerse myself in Aikido for a weekend was well worth it. I don’t think it’s possible to express what I learned at this seminar, or how much I appreciated the experience and instruction. On Saturday, I saw a circle in ikkyo that I’d never seen before, which helped me to see where I need to improve that particular technique. Connection is something I struggle with in many techniques. The world has shown me how to be resistant, but that makes connection difficult, no matter how many circles I try to push or pull uke through. “Relax” was somehow easier to conceptualize and put into practice than other approaches I have tried. Connection comes from center, not from a resistant front. I could feel the difference between connection and resistance in myself, in the application of the technique, and in uke’s response. I have also struggled with ukemi. The reminder to remain just as focused on connection in the role of uke as in the role of nage helped me with honest ukemi. I don’t believe I’ve suddenly mastered anything, but another piece clicked. I’m grateful for the opportunity. Thank you very much. This entry was posted in Seminar Report and tagged Andy Vitale, Marsha Turner, Southern Illinois University Aikido Club. Bookmark the permalink.